In modern conditions the problems of the youth occupy important place as the youth plays a leading role in the civil society and in trade union in particular. Youth’s values and priorities determine our future. According to experts the main problems of the youth are employment, housing, health, social and demographic challenges, and problems in the system of education. Delegates of the 7th FPU Congress note that social and economic crisis led to the decline in living standards of Ukrainian citizens and had a negative impact on the situation of young people in the society. The lack of effective mechanisms of state support for young people made their social formation and development more difficult. Young people are concerned about the absence of opportunities to get a guaranteed job, secondary and season employment, decent work, limited possibilities for professional growth and career development. There is a real threat that it will be not possible to obtain free vocational and higher education. Another social problem of Ukrainian young people is health. There is a tendency toward the increase in disease rates among the youth in Ukraine because financial situation of most families and low income of young people greatly restrict their possibilities to have high-quality food, engage in sports and recreation activities. The housing problem of the younger generation is a pressing issue, due to cuts in funding of state programs to provide young people with housing. All the above demonstrates that the youth needs the protection of trade unions. Active work of trade unions with young people will contribute to the solution of these challenges. The Federation of Trade Unions of Ukraine and its member organizations have developed system of youth structures aimed take real measures to protect the rights of young people to decent life, decent and safe work. – to motivate young people to join trade unions through the social component of collective agreements, sectoral and regional agreements. – increase in the funding of youth housing programs. The future of trade unions lies in the support for the initiative and motivated young people in the trade union movement, giving them opportunities for self-realization! Cooperation with the European Union ranks high among priorities of the foreign policy of Ukraine. The European choice of our country opens up new prospects for cooperation with the developed countries on the continent, gives possibilities for economic and social development, strengthening of Ukraine’s position in the global system of international relations. Ratification of the Association Agreement between Ukraine and the European Union triggered the start of comprehensive reforming of the country on the basis of European standards and values. Its implementation is expected to brig about stable economic and social progress, rule of law, fair taxation, decent work and adequate social protection. Ukraine’s deep European integration should take place in parallel with strengthening of the social dimension, and financial stabilisation should be achieved through economic growth. The pursuit of higher level of civilization development is impossible without formation of the welfare state and this requires public investments in infrastructure, education, healthcare and social services. The Federation of Trade Unions of Ukraine, that represents 6.4 million trade union members, shares common European values of democracy and rule of law, as well as the position of the European Trade Union Confederation that fundamental social rights should prevail over economic freedoms, workers should receive decent wages, insurance payments and pensions in order to reduce inequality and eradicate poverty. Growing inequality people marginalize people, deprives them of basic democratic values, impeding the visa-free regime and, in the future, membership in the European Union. Restructuring and austerity policies, which are opposed by the Federation of Trade Unions of Ukraine, suppress demand and growth, undermine production capacities, and have very negative impact on long-term revival. Liberalisation of public services, particularly in education and health care, is a direct way to privatisation in these sectors and provision of services on the for-profit basis. Weakening of the state control in the field of work leads to the denial of priority of human rights and freedoms, legal nihilism both among employers and employees. Attempts to replace insurance contributions with taxes and insurance payments with social assistance contradict international norms, in particular ILO conventions and recommendations, lead to reduced level of social protection of workers. State’s intention to unilaterally manage the system of social insurance results in antisocial changes to legislation and threatens to liquidate such an important mechanism of social protection as social insurance that, according to the European standards, should be regulated exclusively on the democratic principles. Congress delegates see the Association Agreement between Ukraine and the EU as an instrument to introduce European standards of life in Ukraine and to achieve full membership in the European Union. It is completely clear that Ukraine’s accession to the EU is a long-lasting multistage process. However it is impossible without agreed with social partners policy on industrial production, public services, social insurance and pension provision, coordination of structural reforms, fight against corruption, strengthening of social dialogue and collective bargaining and mandatory character of obligations under collective agreements at all levels. Ukraine needs a “new way” to ensure economic development, investments, creation of quality jobs, addressing social, economic and environmental challenges. We call the Government of Ukraine to initiate new ambitious social Strategy that would contribute to the improvement in living standards and labour conditions, equal treatment, labour safety, quality education, vocational training and life-long learning, sufficient number of decent jobs for youth, quality health care system, social protection and pension system, quality public services, less precarious jobs and voluntary reduction of working hours. Without social and economic progress there is no hope for successful European integration. The implementation of Ukraine’s most ambitions aim should be based on it powerful economic capacities, consolidation of Ukrainian policymakers and aspirations of Ukrainian people. We state that the choice of the Ukrainian society of the European future is definite and final. We are ready together with social partners to make efforts to introduce European social model in Ukraine. And no one can make us change this direction. Delegates of the 7th Congress of the Federation of Trade Unions of Ukraine note that the European choice of Ukraine, the need to ensure sustainable economic development of the Ukrainian society and improvement in the living standards of the population require consolidated action by all parties to the social and labour relations, better effectiveness of social dialogue between trade unions, employers and authorities at all levels. 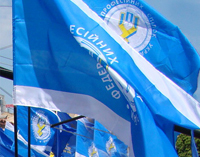 In connection with the adoption of the Law of Ukraine on the Social Dialogue in 2010, that introduced the principle of representativity of trade unions and employers’ organisations, the FPU became the first national trade union confederation that received the certificate confirming its representativity. The FPU initiated the establishment of the Joint Representative Body of Representative National Confederations of Trade Unions that united four other national trade union confederations to further social dialogue and hold collective negotiations on the General Agreement. According to the principles of the International Labour Organisation the social dialogue is one of the elements of the Decent Work Agenda and as a social institution should play the role of a filter to exclude innovations and developments not suitable for the society and introduce socially useful solutions in the economy, state administration, local self-governance, as well as in the distribution of wealth at the level of the state, commune, enterprise by reaching consensus of social partners. This is very important in conditions of large scale reforms that affect rights and interests of all groups of the society. However trade union proposals are mostly ignored, the practice of taking authoritarian decisions that deteriorate people living standards becomes more and more common. A bright example of this is “chronic forgetfulness” by the Government to involve social partners in the formation of the state budgetary policy, in particular while preparing draft State Budget of Ukraine for the current and previous years. As a consequence the utility tariffs are growing, workers’ real wages are reducing while wage arrears are increasing. Particular role in establishing effective and productive social dialogue should be played by the National Tripartite Economic and Social Council. However its activity brings little results, due to the position of the Government. Even on such vital issue as the state and prospects of social and economic development of Ukraine in 2015–2016 in the context of reforms and European integration, the NTESC meeting was five times postponed by the Government from April till October 2015. Taking into account that trade unions’ statements, proposals, protests are explicitly ignored by the Cabinet of Ministers of Ukraine and in compliance with the Law of Ukraine on the Procedure of Resolution of Collective Labour Disputes (Conflicts), in April 2015 trade unions’ JRB put forward its demands and subsequently, on the FPU initiative, entered into national collective labour dispute (conflict). Demands of the trade unions’ JRB during conciliation procedures were partially satisfied while principal demands remained completely unsatisfied. Taking this into account trade unions’ JRB organised a series of pickets of state authorities including on the World Day for Decent Work. At the same time during consideration of the collective labour dispute (conflict) with the employers’ JRB demands of the trade unions’ JRB were partially satisfied and the parties for the first time agreed the obligatory character of the decisions of Labour Arbitration. Trade union’s active position, actions taken by them, and unwillingness of authorities to hear the most representative and real organisation made the Government to act in a mean manner attempting to undermine collective bargaining at the legislative level, to destroy the system of sanatorium and resort treatment of workers and the system of public control over the labour legislation and labour safety, etc. In these difficult conditions only through consolidated and clearly determined actions the trade unions can protect rights of their members. At the same time due to the cooperation between the FPU and parliamentary factions of Petro Poroshenko Bloc “Solidarity”, All-Ukrainian Union “Fatherland”, Union “Self Reliance” it was possible to reject some provisions in antisocial reform draft laws prepared by the Government that restricted citizens’ rights and guarantees. – to support legislative proposals of trade unions to the draft Labour Code of Ukraine and the Law of Ukraine on Collective Agreements that sectoral and regional agreements should cover all relevant enterprises while collective agreements at workplaces should cover only members of those trade unions who concluded such agreements.